India is the only country where you can see all kinds of motorcycle such as sports bike, cruiser bike, super bike and of course commuter bike. In this post, we are introducing some cruiser bikes that offer fuel efficiency of 20 KMPL to 44 KMPL, and for those who love to ride, comfort and luxury. If you are seeking for a cruising motorcycle, this post will help you to find the best cruiser bike. Based on the ongoing Bullet 350, the Bullet Trails 350 is an all-new product in Royal Enfield Indian lineup. The motorcycle is named after the Royal Enfield motorcycles used to run off-races in the 1950s and features similar body language. It is a dual purpose motorcycle which gives the rider’s freedom to take bike easily off-road as well as on-roads. Use of chrome and silver, luggage rack, raised rear fender, upswept exhaust unit as well as the gaitered front forks are among major highlights and separates it from the standard Bullet 350. Getting retro-scrambler DNA in styling, the bike gets power from the shared powertrain from Bullet 350. However, without any electronic adjustments, 346cc single-cylinder continues to make out 19.8bhp and 28Nm through a five-speed gearbox transmission. It is the top end variant in the Trails range and features a more powerful 499cc single-cylinder engine lends from the Bullet 500. The power figures are also similar at 26.1bhp and 40.9Nm and sent to the rear wheel via a paired 5-speed gearbox. Sits on similar platform underpinned to Bullet 500, the Royal Enfield Trails 500 features equipment like spoke wheels shod up with dual purpose tyres, upswept handlebar and raised rear fender which improves motorbike’s water-wading capabilities and a luggage rack as well that sports in carrying belongings instead of a pillion companion. The motorcycle is likely to return fuel mileage as similar to Bullet 500 due to both shares their powertrain. Jawa Standard is the mid-variant in the Jawa Motorcycles lineup in India. The motorcycle features the design language that won over the hearts of the Indian customers during its last innings in India. A neo-retro motorcycle in nature, the bike features a lot of chrome and the flowing lines as similar to the original Ideal Jawa that was on sale in India. The motorcycle is being offered in colour options of Grey, black and maroon at the price sticker of INR 1.64 lakhs. Beneath the fuel tank, shared powertrain unit from the Jawa Forty Two, the 293cc single-cylinder liquid-cooled engine makes out 27bhp and 28Nm via a mated six-speed gearbox. The single-channel ABS is standard with a 280mm disc brake up front and a 153 mm drum brake at the rear. Jawa Forty Two is an entry-level model from the Iconic motorcycle brand resurrected by Classic Legends in India. Sportier in styling with a host of cosmetic difference from the Jawa Standard, the Forty Two shares mechanicals from the later. The 293cc single-cylinder liquid cooled engine with a six-speed gearbox makes out 27BHP and 28Nm. Priced at INR 1.55 lakhs, the Jawa Forty Two comes in a range of colours with a black handlebar, blacked-out bar-end mirrors, and a digital odometer and trip meters. The chrome work on the bike very little as compared to Jawa Standard. The single-channel ABS is being offered as standard with a 280mm front disc and a 150mm rear drum brake. The Interceptor 650 is a retro roadster with an upright riding stance. The pricing for the motorcycle with retro styling elements and touring friendly dynamics start at INR 2.50 lakh and goes up to INR 2.70 lakh for the top end Chrome variant. It is one of the 650 twins being offered by the company with the brand’s first most powerful twin-cylinder engine. The all-new 648cc, air-cooled, SOHC, fuel-injected, parallel-twin motor pumps out 47hp at 7,250rpm and 52Nm of torque at 5,250rpm via a mated 6-speed gearbox with a slip-assist clutch. It features the larger fuel tank with capacity 13.4 liters and 202kg dry weight around 4kgs heavier than the cafe racer sibling. Suzuki Intruder SP is the top end variant in the Intruder lineup in India. Tagged with a premium price tag of INR 1.05 lakhs got updated with a host of advancements such as the introduction of a new all-black colour scheme with red highlights running from the tank to the rear section. Also, the automaker is offering a pillion backrest as the standard fitment. Mechanically, the motorcycle continues to get power from the same 155cc, single cylinder engine that churns out 14.6bhp and 14 Nm of torque. In the segment, the motorcycle sees competition with the Bajaj Avenger Street 180. Royal Enfield has equipped the Classic 500 with the ABS system. Equipped with ABS system, the standard variant of the model is priced at 1.99 Lakh (ex-showroom) while the top end trims like the mat-finished and the chrome model attracts INR 2.02 lakh and INR 2.10 lakh price sticker respectively. Mechanically, the motorcycle continues to be the same with the 499 cc single-cylinder air-cooled engine that makes out 27.2 bhp and 41.3Nm respectively via a mated 5-speed manual transmission. The braking setup comprises dual channel ABS in contribution with 300mm disc at the front and 240mm at the rear. Triumph has launched New Street Scrambler in India at INR 8.1 lakh (ex-Delhi). It comes with a 900cc liquid-cooled parallel-twin engine that makes the maximum power of 55PS at 6000rpm along with 80Nm peak torque at a low 2850rpm. This variant is available in 3 different sheds such as Korosi Red Frozen Silver, Matt-Khaki-Green, Jet Black. Based on the Street Twin, the cruiser gets a split seat with a detachable pillion seat pad and an underbody bash plate. Bajaj Auto to give a low-end cruiser entrance to the Indian masses revived it’s avenger range. And the Avenger Cruise is the 220cc variant of the Avenger series. The most powerful, stylish and comfortable cruiser in 220cc segment in India along with two stylish colors as Golden Beige and Divine Black. The Cruise 220 is equipped with necessary accessories which are so needy and helpful while long-run touring. The components includes well-padded seat, backrest for pillion rider, optional windscreen, raised handlebar, wider rear tyre and excellent dimensions with a ground clearance of 169mm and fuel capacity of 14 liters along with healthy mileage figure essential for wandering on to the long drive. 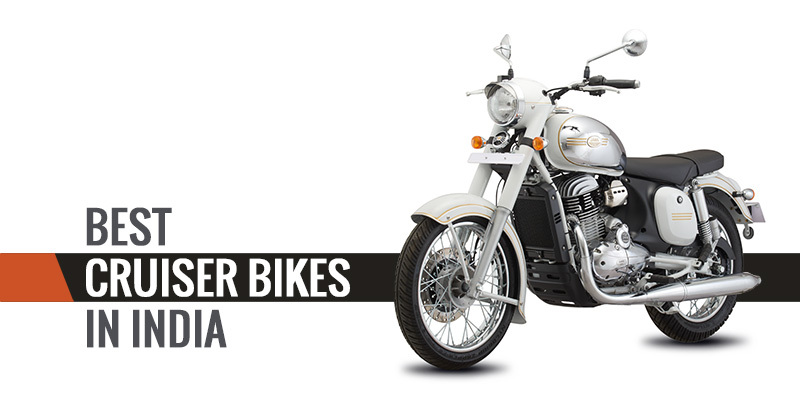 Royal Enfield is the leading home-based cruiser manufacturer company. The RE Classic 350 is an amalgam of retro design and modern technology, which went through some of the cosmetic changes as mudguard design, different logo graphics on the fuel tank and the tail light than its Bullet 350. Powered by a 346cc, single cylinder, 4 stroke twin spark, BS IV engine unit which belts out 19.8 BHP of power and 28 NM of torque and the whole setup is mated to a five-speed transmission. The comfortable one returns the fuel economy of 35 Kmpl with the storage capacity of 13.50-liter petrol. The Renegade Commando Fi is one of the cruiser offerings by the American manufacturer company, UM Global, which recently launched its Renegade range-Commando, Sports S and Classic at the 13th Delhi Auto Event in 2016. Recently the deliveries have not begun for motorcycles to the buyers. But since from its showcased, it wins the heart of Indian masses and will perform well. Powered by 280cc single-cylinder, BS IV and air-cooled motor it uses the churns power of 24.8 bhp and torque of 21.8Nm which the connected five-speed gearbox. The motor returns the claimed healthy mileage of 30 Kmpl which is good for tourers who loves to ride long journey on its cruiser bikes. The Thunderbird 500 is one of the cheapest machines among the cruiser bike. The Royal Enfield India produced the category of cruiser bikes including Bullet, Classic, Thunderbird and Continental GT. Moreover, the ultimate highway cruising machine comes equipped with all the new innovative features like electric start, front disc brake, instrument panel along with digital trip meter and projector headlight. The innovative cruising machine houses a 499cc displacement, BS IV emission norms motor that throws a grunt sound on the road, while the fuel economy of this bike is only 20 kmpl. The Aquila 250 is the iconic cruiser motorcycle offering by DSK-Hyosung. The motorcycle has stunning design and lower engine displacement which is pretty much enough for daily purpose cruising. The Aquila 250 is powered by 249cc air-cooled and V-twin engine which returns 26.21 BHP of power at 95000 RPM and 21.37 NM of torque at 7000 RPM. The power is sent to the rear wheel via a five-speed transmission. The motorcycle respectively returns a mileage of 22 KMPL. The kerb weight of this motorcycle is 179 KG which not just heavy and makes it easy to ride in the city traffic.